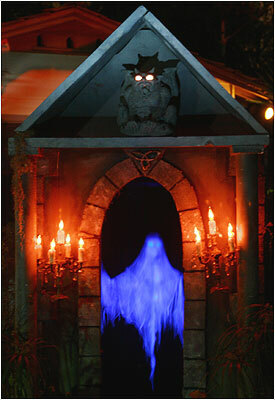 Wonderfully creepy in an old-fashioned Gothic way, the Haunt with No Name Yet emphasizes mood instead of shocks. Entering the premise is like entering a mystical realm. There is an overall sinister feel, with the layout of the corner house’s front yard nicely utilized to create the sense that you are approaching a dark and dreadful place. The tone is set at just the right pitch for a neighborhood yard haunt – effective and memorable but not too scary for trick-or-treaters. In operation since 1996, the Haunt with No Name Yet is one of the oldest home haunts in Los Angeles. Located in a quiet, dark residential area, the Haunt With No Name Yet's wide front yard of a corner lot is filled with shrubbery and trees that block the light, lending an extra touch of authentic atmosphere. The lighting scheme is low-key, and you will have a hard time taking photographs even with your night vision digital cameras. The decor consists of a stone gate, tombstones, ghosts floating from trees, fog, shrouded figures, and a myriad of imaginatively carved Jack-O'Lanterns. The tableau are mostly static, but there is a nice moving candle that seems to hover in the air above a stone sarcophagus. Even more impressive is the large upright crypt with a floating spirit inside.